The Intergovernmental Panel on Climate Change (IPCC) recently released a special report on the social and economic consequences of 1.5 degrees Celsius (2.7 degrees Fahrenheit) of warming compared to 2 degrees Celsius. Changing the temperature in your home by one or two degrees may not seem like a big deal, but when temperatures change across the globe by that much, major cities will be threatened by sea level rise, and millions of people will be uprooted from their homes. Rising seas are already affecting coastal communities and small island nations, and the report found that 1.5 degrees C of warming could mean about 0.26 meters (0.85 feet) to 0.77 meters of sea level rise by 2100. For 2 degrees C, average sea levels could rise an additional 0.1 meters. Every tenth of a degree means more people evacuating to find another place to live. 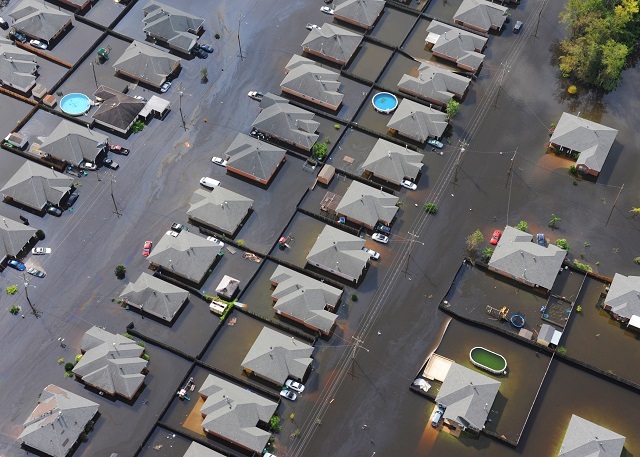 the 0.1-meter difference could expose 10 million more people to flooded homes, according to the report. Experts at the IPCC also warned that if ice sheets in Antarctica and Greenland break apart and melt, multiple meters of sea level rise could be seen in the long term. The higher the temperature climbs, the more costly and dangerous the impacts. If we don’t take action to reduce emissions, global warming could reach 2.7 to 3.7 degrees C by 2100, which could result in significant damage to low-lying areas and more than a meter of sea level rise. Climate scientists recently released a study indicating that if emissions aren’t reduced, sea levels may rise up to 1.5 meters (5 feet) by 2100. This much sea level rise could submerge land currently home to more than 153 million people. The study, led by Robert Kopp of Rutgers University and co-authored by scientists at Climate Central, looked at how the break-up of Antarctic ice sheets could cause sea level to rise even faster than previous estimates. The rapidly growing port city of Guangzhou in China has a population of 14 million and, according to a 2013 World Bank report, has the most to lose economically from climate change. Climate Central researchers estimate that due to sinking land and ice mass loss from Antarctica, Gulf and East Coast states in the United States are especially vulnerable to sea level rise. New Orleans and New York City are shown below. About 12 million people live in the coastal mega-city of Mumbai, making it the most populous city in India. The “financial heart of India” houses important economic institutions such as the National Stock Exchange. Osaka is a major port and commercial hub in Japan. The city’s off-shore airport, Kansai International Airport, is near sea level and was flooded in September after a typhoon. Seas will most certainly rise by the end of the century, threatening major cities and the livelihoods of millions of people, but the extent of rise depends on governments stepping up to set goals and policies that limit warming. It’s clear from these maps that every foot of sea level rise matters. The next few years are crucial for avoiding catastrophic damage. The good news is we have the tools we need to make far-reaching changes to how we power our homes and businesses, grow our food and design our cities. Make your own maps of sea level rise on Resource Watch and create data visualizations like the map below. This blog was originally published on Resource Watch. Emily Cassidy is a Data Journalist for the World Resources Institute, where she works to expand visibility and impact of WRI’s research and the Resource Watch platform.